Many hobbyist IoT projects running on the Raspberry Pi (RPi) require a webserver running on the RPi which receives requests from a browser, where the client using the browser is connected either to the local WiFi network, or possibly (via a port forwarding setup), connected to the public Internet. An alternative that is easy to setup, lightweight and low cost is one that makes use of Amazon's SQS (Simple Queue Service) to setup two queues. 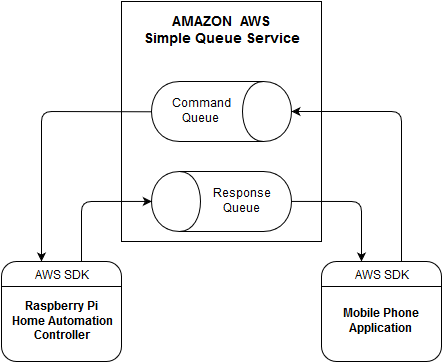 One queue is for commands - from a mobile application to the RPi. Another queue is for responses - from the RPi back to the mobile application. It results in a simple and easy to secure solution available over the public Internet. It requires no port forwarding - both endpoints make use of a client connection to Amazon AWS. Given the small amount of messages needed for typical hobbyist project, the SQS component will be covered by the AWS free tier. On the Raspberry Pi, a lightweight application is running that makes use of the excellent Python boto3 AWS SDK library. It is always waiting for a command to arrive in the command queue. As soon as it receives a command, it processes it and adds a response to the response queue. On the mobile device an Android application is running that makes use of the AWS Mobile SDK for Android. When the user presses a command button, such as 'Open Garage Door', it adds a command to the command queue, and asynchronously waits for a response to arrive in the response queue. When it receives a response (e.g. the command's success or failure status), it updates the app's user interface.